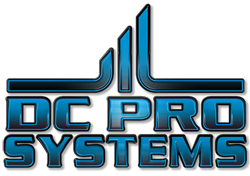 DC Pro Systems Automation Systems. You walk into the front door of your office & the air conditioning has been already set, half an hour before you came in. The lights turn on automatically, down the hallway leading to the keypad when you open the front door. You disarm the alarm & the music & TV turns on to a preset station, channel & volume level you want. The rest of the lights in the office turn on immediately, to a specified light level for each room. There is a voice message waiting for you from your co-worker, telling you about an important shipment being delivered today. Someone knocks at the back door & you look at the cameras to see who it is. All this is happening in an instant, from the same convenient touch panel, mounted on the wall. You can easily log into the same system & access these devices from a web browser or mobile device, from anywhere. 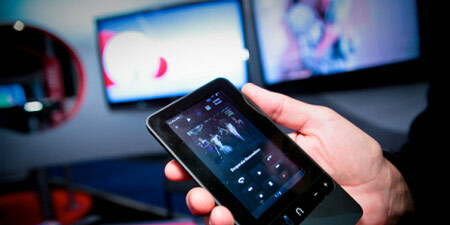 Turn on music & TV to your favorite channel or station by event, schedule or by the touch of a button. Turn the thermostat on higher or lower or to a preset level by event, by a schedule or by the touch of a button. Leave or play-back an important message from someone & have your favorite pictures or logos automatically scroll on the high resolution display. View live video from interior or exterior cameras, anywhere on premise from the touch screen keypad or web browser. Turn on & dim individual or all rooms lighting to your favorite scene by event, by a schedule or by the touch of a button. Arm or disarm the security alarm system by event, by a schedule or by the touch of a button.